Bangui is the capital and largest city of the landlocked nation of the Central African Republic. The city had a population of 750,000 people in 2012 which is about 16% of the nation’s 4.6 million people. Bangui spans an area covering 67 square km, or 41.6 miles, and is named after the rapids in the Ubangi River on whose bank the city is situated. Across the river are the Democratic Republic of Congo and the town of Zongo. Due to Bangui being located near the equator the climate is hot and humid throughout much of the year and heavy rains that lead to flooding are common. 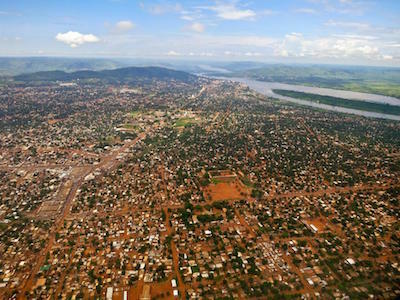 The history of Bangui began on June 25th, 1889 when the town was founded during the height of European colonial expansion following the Partition of Africa in 1885. The French explorer Michael Dolisie established it close to the juncture of the Ubangi and Mpoko Rivers. Hard times followed the founding of Bangui. Maurice Musy and Paul Comte, two colonial commanders, were both killed during combat with the indigenous populations in 1890. In 1891 the town was moved up river and became the base for French infiltration north toward the country of Chad and east toward the Nile River. During its colonization Bangui served as the French administrative center for the region called Ubangi-Shari. On December 11th, 1906 Bangui was detached from the Middle Congo and became the capital of the Ubangi-Shari region created in 1903. In 1960 when the Central African Republic gained its independence from the French, Pan-Africanist leader Kwame Nkrumah, then president of newly independent Ghana, suggested that Bangui become the headquarters for the Organization of African Unity. The headquarters was eventually located at Addis Ababa, Ethiopia but since independence, the city has hosted numerous inter-African meetings. Bangui has many landmarks within its boundaries that reflect its rich history and culture. The city’s most distinctive landmarks date back to the 1970s when President—and later self-declared Emperor—Jean-Bédel Bokassa built an elaborate royal palace and a large triumphal arch honoring his reign. Even after Bokassa was deposed in 1979, the monuments remained as a stark reminder of the tyranny of the Emperor. The city is surrounded by various archeological sites that contain remnants from the Iron Age. French is the official language of the city and country. Prior to colonization however Sango was the native language spoken in the Central African Republic and the Ubangi River region. The language is still spoken by many people in Bangui and throughout the country. The main religious groups are Catholics, Muslims, native religions, and Protestants. The people who comprise the majority of the city’s inhabitants are migrants from the countryside who seek a better life in the capital. Since independence in 1960 the Central African Republic has undergone frequent military and political strife. Because of this violence, the city has been named one of the most dangerous places in the world. There is a lack of general sanitation and potable water, a situation made more difficult by the constant arrival of new migrants from the countryside. Roman A. Cybriwsky, "Bangui," Capital Cities around the World: An Encyclopedia of Geography, History, and Culture (Santa Barbara, California: ABC-CLIO, 2013) Pierre Kalck, "Bangui," Historical Dictionary of the Central African Republic (Metuchen, New Jersey: Scarecrow, 1980); "Bangui Map," Maps of the World, http://www.mapsofworld.com/central-african-republic/bangui.html.